Translated by Johana Montalván C.
In a trip to register the geographical and cultural attractions of the district of Chiquián, as part of the Investigation Project on the Quipus of the Community of Cuspón (UNMSM), accompanied by Filomeno Zubieta Nuñez (UNJFSC), the journalist Rafo León, and guided by Roberto Aldave (Ecoaventura), who had visited the place previously, we had the opportunity to identify a cave with stunning images of rock art. As we know, the rock art that primitive human populations bequeathed us constitutes, on a worldwide basis, one of the first artistic demonstrations and a still incomprehensible means of communication in many cases. In that sense, the aim of this article is to throw light on whom were the old inhabitants of the zone of Chiquián and their cultural manifestations. In Perú, Chiquián is at present the capital of the province of Bolognesi in the region of Ancash and shelters in its territory diverse ecological zones. It is surrounded by a majestic mountain range, whose highest mountains are capped with permanent snow and reach heights of six thousand meters. This region is known as Janca, and it is where the intrepid andinistas go in order to reach its summit. It is at the bottom of snowy mountains where very steep slopes and some flat sections of the ground are covered with ichu lie; this part is called Puna or Highland region and its altitude ranges from 4100 to 4800 meter above sea level. The other ecological strip is known as Suni and extends from 3500 to 4100 meters above sea level. Adjacent, in a lower altitude, the Quechua region is found, going from 2500 to 3500 meters above sea level; it is here where the today’s population is located. There was, therefore, a varied climatic and productive distribution which offered unique resources which were exploited by the ancient chiquianos for thousands of years. And that is what we have been observing and verifying through archaeological explorations in this spectacular Andean geographical space. However, in focusing on the objective of this paper, we should highlight the finding of an extraordinary center of rock art in the highlands of the district of Chiquián. It is a cave at the bottom of large rocky cliffs, or farallones, on whose interior walls we observed a peculiar setting of rock art and a cultural deposit that had accumulated on the ground of the natural cavity thousands of years before the present. The cave is six meters wide, seven meters 20 centimeters long and two meters and 20 centimeters high. 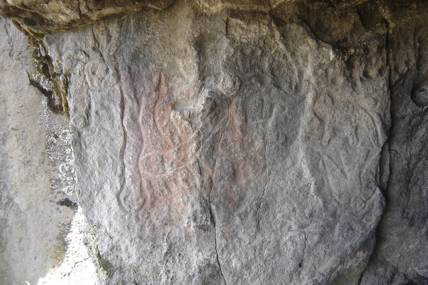 It calls to attention the way in which its primitive occupants left numerous figures or drawings along the wall of this rocky shelter with the exception of the ceiling, by means of the technique of engraving on the rock, which is known as petroglyphics in the studies of the rock art. Thus, only these petroglyphs decorate the rocky walls, and paintings make no appearance. Surely the artist(s) that made the engravings had to use a sharp stone with which they carried out the engraving; consequently all the representations were based on incise lines that superficially cut the rock. In fact, the figures are distributed from the entrance of the cave inward, and they cover all its walls, from one extreme to another. Engraved printing of snakes appear, falling birds, a batrachian, anthropomorphic faces and quadrupeds not exceeding 70 centimeters. There are small rectangular—rare, nevertheless—concavities, unlike Atún Machay’s cave, found around the Laguna de Conococha by Federico Kauffmann. It is notorious that both caves, that of Sagsha and that of Tuna Machay are related. There are also other geometric figures and a horizontal row with more than two hundred tiny pits spread out from one extreme of a wall to another. Each dimple is about five or six centimeters deep. This line of dimples divides the rocky wall into two spaces: a lower space with many designs and an upper one where figures are scarce. The faces express gestures; one has a normal eye which has a circular pair. Another features diamond-shaped eyes and a mouth that seems to be smiling. Further along, there is a face expressing sadness. The profile of a quadruped as well as the profiles of people with floating hair appears. Other engravings of profiles that at first sight seem to be of monkeys or felines, look ahead and possess long and exaggerated tails. A quadruped of “schematic processing” look—meaning it has been done based on lines and has vertical position—can be observed in the central part and above the row of dimples. There are also other geometric designs below the row of dimples. Although common in other places with ancient rock art, in this case neither camelids, nor cervids, nor full human figures appears. The preceding image sets an example of the figures that seem to represent apes or other quadrupeds. They are associated with other designs of snakes, birds, anthropomorphic faces and still unidentified designs. In general, the predominant style is not simple, but rather shows a greater complexity by detailing some aspects of those figures. For example, we observed a feline whose body was full of points and striped bird’s figures; the stripes might represent the feathers. Faces of austere countenance with the corners of the mouths turning downward or upward appear, seemingly denoting joy. The antiquity of this center of rock art is still a mystery; a methodical study needs to be done in order to ascertain it. This implies a need to analyze the mural iconography and to excavate the ground of the cave—the one that seals a rich cultural deposit. Only those investigations and subsequent analysis of the results will be able to tell with certainty the period in which the human occupation in this millenary refuge took place. Nevertheless, we can get close to understanding its antiquity with a certain accuracy, if we keep in mind that a few years ago the archaeologist Thomas Lynch pointed out that in the caves of the Callejón de Huaylas, eight thousand years ago, humans inhabited the caves, using them as refuges as well as routine activities. As the cave of the present report lies on the boundary of the previously mentioned alley or Callejón and the territories of Chiquián, it is possible to affirm that cultural links existed in that time. 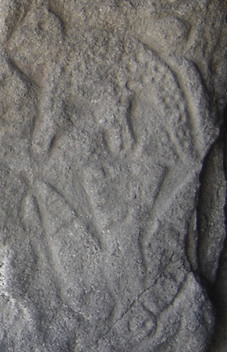 Due to the fact that there are falling birds among the represented figures, it is also possible that the petroglyphs of the cave could be younger, since such scenes are frequently observed and pertain to the sea. Another argument is that the lack of complete anthropomorphic images, camelid and cervid images is proof of creation in times of hunter-gatherers from the Archaic period. Nevertheless, these appear, for example, in the rock scenes of Lauricocha (Huánuco), Toquepala (Tacna) and Quilllamachay (Huancavelica). However, certainly, these examples correspond to paintings but not to petroglyphs as is the case of Chiquián. We consider, on the other hand, that this rocky cavity is notable for the rock art engraved on its walls. It is a true petroglyph embroidery whose author or authors—in a display of baroque iconography—have not left empty space or surfaces. The display of figures as high aesthetic representations, keeping a similar style when it comes to the outline of figures suggests that this is the work of a single artist, which would be admirable. At a regional level, Ancash represents the first and main sanctuary of petroglyphics. We could say, with some reservation, that it is a true Sistine Chapel of chiquiano parietal art from pre-hispanic times. Its engraved language printed on rock whose meaning is still unknown provokes a sense of mystery for us. In contrast, its ancient occupants knew how to interpret the message ciphered on rock. They ‘read’ the scenes and fully understood their meaning just like when nowadays we do it when we enter a temple and observe paintings, representations or engravings that evoke the Passion of Christ or other scenes of the biblical story. A real sanctuary or a millenary temple, the cave we have explored is a symbolic and emblematic rocky cavity from pre-hispanic chiquiana and Andean aesthetics. We still do not know what strange rituals could have been carried out inside the cave. However, we do know it is an authentic demonstration of the first paleoartistic expressions of that area. Its conservation is one of paramount concern and this responsibility falls on the chiquianos of today—the ones who are responsible for eternalizing the message left by the human groups of the past and communicating it to future generations. of rock art in the highlands of chiquian, perú.